1913 – Blues legend Muddy Waters was born in Clarksdale, Mississippi. Born McKinley Morganfield he was a pioneer in the field of blues and had a profound impact on the history of rock and roll, influencing artists throughout the United States and in Britain, where many members of what was called the “British Invasion” cited him as an influence. He had numerous major hits, including “Rollin’ Stone,” “Hoochie Coochie Man,” “Mannish Boy” and “Got My Mojo Working,”and was inducted into the Rock and Roll Hall of Fame in 1987. 1928 Poet and novelist Maya Angelou was born in St. Louis, Missouri. Born Marguerite Johnson, Angelou worked for years as an actress, dancer, editor, and was prominent in the civil rights movement in the United States. She is most well-known as a poet and an author. He most well-known book was “I Know Why the Caged Bird Sings.” Four more volumes appeared during the next two decades, as well as several books of poetry. She served as a Professor of American Studies at Wake Forest University in Winston-Salem and read one of her poems at the inauguration of President Bill Clinton. She was awarded the Medal of Freedom by President Barack Obama in 2010. (See Maya Angelou’s profile at greatblackheroes.com). 1968 – Civil Rights icon Dr. Martin Luther King, Jr. was shot and killed in Memphis, Tennessee. He was 39 years of age. 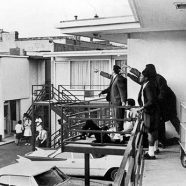 King was standing on the balcony of his room on the second floor of the Lorraine Motel with he was struck by a bullet from a sniper’s rifle. King was in Memphis to lend support for a sanitation worker’s strike. Over the course of the last year he had begun to speak out against the Viet Nam war and expressed concern about the plight of the economically disenfranchised. As word of the assassination spread throughout the nation, riots broke out in major cities all across the United States. He was buried on April 9 in his hometown of Atlanta, Georgia. James Earl Ray was eventually captured and convicted of the shooting.